The Progress-Focused Approach: How do you interpret it when you find something hard? A paper by Miele & Molden (2010) describes five experiments in which people had to do tasks in one of two conditions. 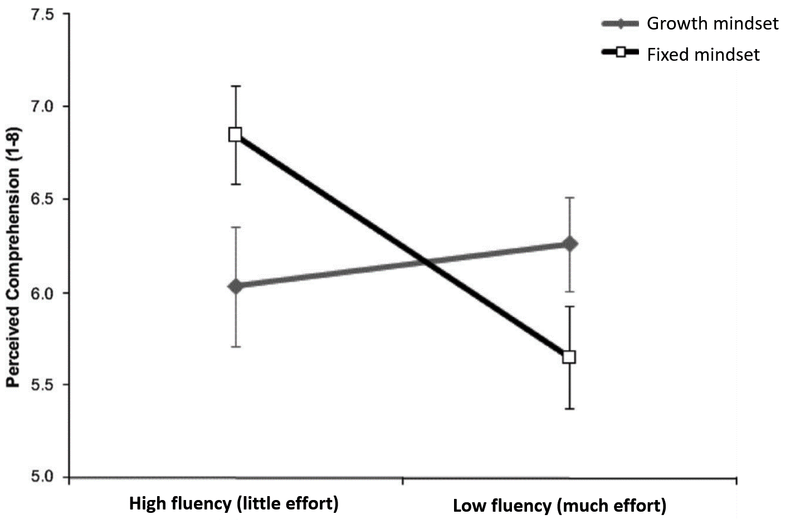 In one condition the process fluency was high, in the other it was low. The difference in processing fluency did not lead to an actual difference in comprehension of the text. In both conditions the participants demonstrated that they had understood the texts equally well. But what also became clear is that people with different mindsets had different interpretations of having to put in much effort. People in a fixed mindset responded according to the ELER principle. With a high processing fluency they said they felt they understood the text well. But when processing fluency was low (when they thus had to put in much effort) they felt they did not understand the text very well. This was quite different for people with a growth mindset. In condition 1 (little effort) they had a slightly lower feeling of comprehension and in condition 2 (much effort) they had a higher perception of comprehension. The figure below illustrates this pattern. Is finding something hard an indication of lack of ability? When people in a fixed mindset find a task rather hard they tend to interpret this as an indication that they are beginning to reach the limits of their abilities. Their interpretation is: "That I am finding this so difficult means that I have little talent for this." Although this does may not necessarily influence their performance right away it may lead to them avoiding this topic the next time due to which their long term learning trajectory may be negatively affected. People in a growth mindset have a different interpretation. 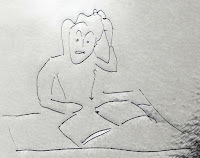 They view having to put in so much effort as an indication that they are still in the process of trying to understand the text so they conclude that they have to continue putting in effort. For people in a fixed mindset finding something hard seems to be a signal that something is going wrong whereas for people in a growth mindset it is a signal that they should persist. A paper by Miele et al. (2011) shows similar results. They carried out two experiments in which participants studied lists of words and then had to predict how well they would remember these words, later on. What they found was that participants in a fixed mindset felt in the high fluency (low effort) condition that they were learning a lot and predicted that they would remember a lot. But participants in a growth mindset felt they learned more in the low fluency (high effort) condition. This type of findings was also found in a field study by Miele et al. (2013). They had primary school children read a text in an either easy or hard condition. The more the children had a fixed mindset, the more they interpreted the extra needed effort as a decrease in their comprehension. It may be useful to reflect on your own experiences and tendencies when you are doing something which you find hard. Do you tend to want to stop when finding something hard or want to continue? 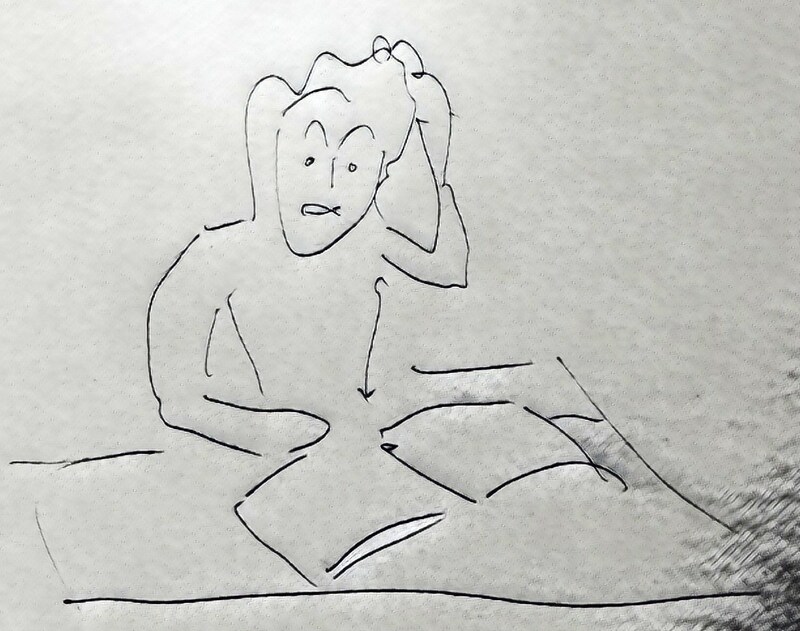 How easy or hard a skill or knowledge field seems to you may not be the best way to determine whether you should you should pursue it. Finding something hard is no indication you cannot learn the skill or knowledge. Instead, more useful indicators are your interest in the skill or knowledge and how important they seem to you. These factors are likely to be reliable predictors of whether you will be motivated to put in the prolonged effort which is needed to become really good at anything at all. Does this information change anything for the way you approach your development?